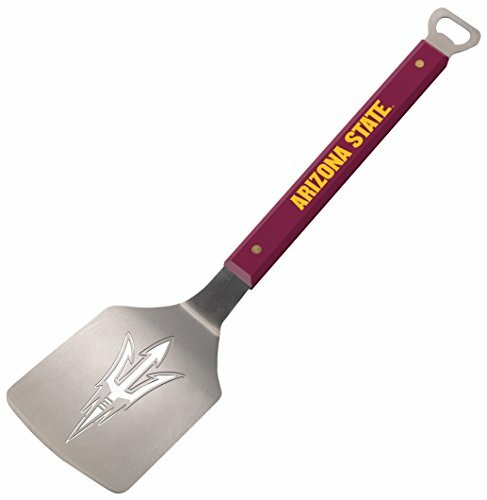 Take on grill time with winning confidence using an officially licensed Arizona State sun Devils spirit series sportula grill spatula. 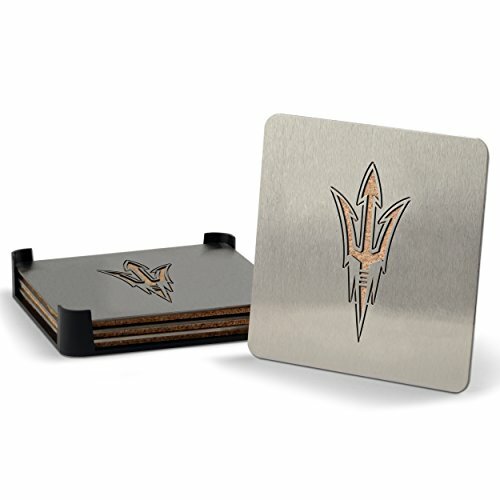 Sun Devils is stamped on the brass-riveted team-colored composite handle the team logo is laser cut through the heavy-duty stainless steel blade and the integrated bottle opener adds the finishing touch. A perfect gift for any Arizona State sun Devils fan and the ultimate in tailgating accessories. The perfect Arizona State gift for a Man or Woman!- A Deluxe ASU Apron! This Broad Bay Cotton deluxe Arizona State apron features an adjustable neckband, generous waist ties, and roomy front pockets. Great in the kitchen, at the grill, or for Arizona State tailgating. This well made Official NCAA ASU Apron is machine washable and made with tough 8 oz polycotton stain resistant fabric. It makes a unique Arizona State gift idea. 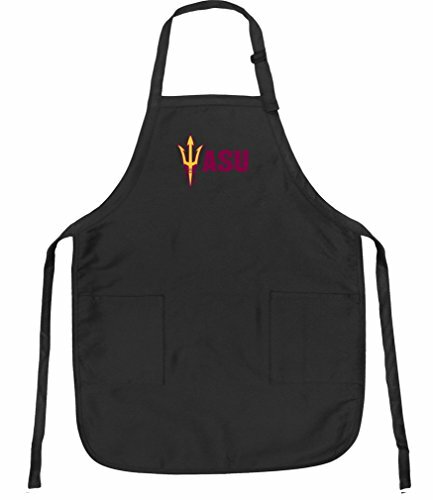 These Are Official ASU Aprons - Up to 12% Returned to Support Arizona State Programs! 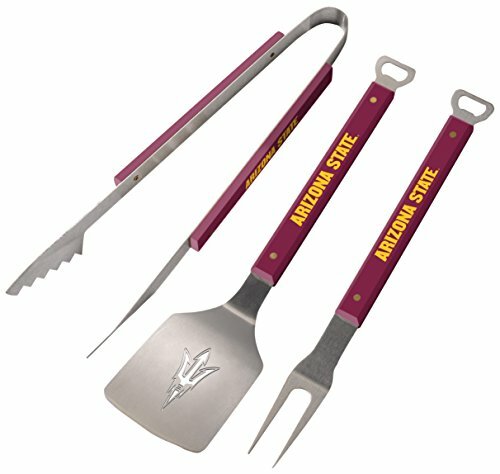 Get your grill game on with an officially licensed set of Arizona State sun Devils sportula barbecue tools. 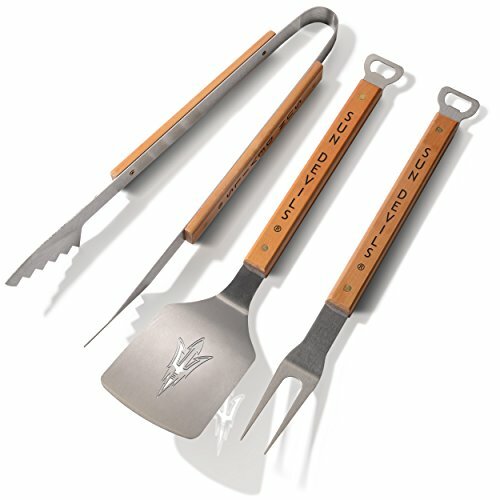 The barbecue tool set includes a sportula a pair of tongs and a grill fork. Each tool is made from heavy-duty stainless steel with brass-riveted handles. 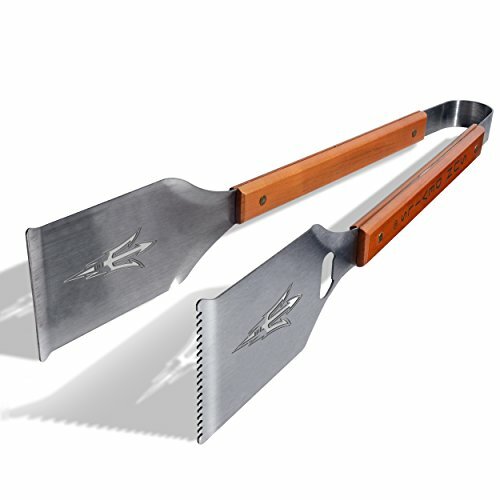 Sun Devils is stamped on the handles and the team logo is laser cut through the blade of the sportula. The sportula and the fork both come with an integrated bottle opener. An unforgettable gift for any Arizona State sun Devils fan and the most noticed accessory at any tailgating event. This NCAA BBQ Apron Tote Pro combines quality form with function to create this stylish BBQ set for the grill master/football fan in your life. 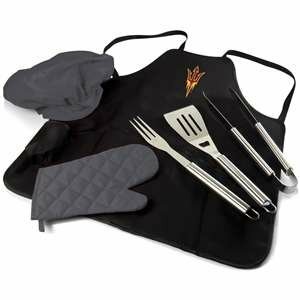 This tote unfolds and converts into a full-size apron with a deluxe barbecue set stored inside, including one each: large grilling spatula with integrated bottle opener, large BBQ fork and tongs, all with cylindrical hand grasps and hooks on the ends for hanging. The apron tote, made of durable polyester canvas with your favorite team's logo and coordinating trim, also comes with a quilted oven mitt and an adjustable chef's hat. Additional nifty features include numerous pockets specifically designed to maximize storage of the items typically used when barbecuing, such as condiment bottles, spice shakers and cool cans of your favorite beverage. Adjustable crisscross back straps that buckle to each side of the apron allow for maximum comfort. The NCAA BBQ Apron Tote PRO makes a fabulous gift. The perfect ASU Grandma gift for a Man or Woman!- A Deluxe Arizona State Grandma Apron! This Broad Bay Cotton deluxe ASU Grandma apron features an adjustable neckband, generous waist ties, and roomy front pockets. Great in the kitchen, at the grill, or for ASU Grandma tailgating. This well made Official NCAA Arizona State Grandma Apron is machine washable and made with tough 8 oz polycotton stain resistant fabric. It makes a unique ASU Grandma gift idea. These Are Official Arizona State Grandma Aprons - Up to 12% Returned to Support ASU Programs! Show off your team spirit with the NCAA Arizona State Cap. It comes in the team colors and features the logo. This NCAA cap is ideal for wearing to a game or for any other casual occasion. It makes a thoughtful gift for the special alum or team fan in your life. Your unyielding devotion lies with the Arizona State Sun Devils and you want everyone to know it. Display your team spirit when you rock this Endless adjustable hat from Russell. It's decked out in the most fascinating graphics that will get you pumped up for Arizona State Sun Devils game day. Why expose your grill to the elements when you can provide cost-effective and lasting protection? 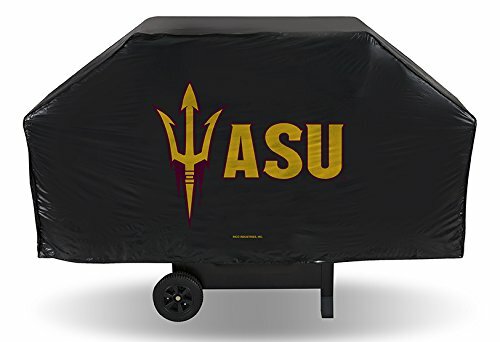 This Arizona State Sun Devils Grill Cover is a great way to protect your grill from bad weather and show off your favorite team. Made with weather resistant, heavy duty reinforced vinyl and a flannel backing, resists cracking even in the colder weather. Has drawstring bottom to ensure a secure fit. Measures: 59" x 19" x 42"
Show support for your team any day of the week wearing this NCAA Men's Arizona State Sun Devils Mossy Baseball Team Cap. It's made of soft yet durable polyester and has a traditional style. This Arizona State Sun Devils cap protects your head and eyes from the elements. It features the team name and university initials embroidered on the front. Stay comfortable as you show off some team pride with the NCAA Arizona State Sun Devils T-Shirt. It is made of a blend of 90 percent polyester and 10 percent cotton with the familiar Sun Devils logo on the front. It also features a V-neck design to keep you cool, especially when it is hot outside. This short sleeve V-neck T-shirt is an ideal gift for a recent grad or fan of the Sun Devils' athletic teams. Support your team in style with this comfortable Women's "Swizzle" long sleeve side slit hooded t-shirt from Colosseum. This team color long sleeve t-shirt features washed out screen printed team logo on the chest, team name on the back tail, deep side slits for a relaxed fit, hood with drawstring, and is made of 95% polyester/5% cotton speckled yarn. Officially licensed by the NCAA. Ladies, help support your team in this stylish new "Big Sweet'" V-neck shirt from Colosseum. The team color short sleeve tee features distressed printed team graphics on the front & back, dual blend, and a v-neck opening. Made of 65% polyester/35% rayon and officially licensed by the NCAA. This College licensed sporty Hoodie Tee Shirt features a screen printed Team Logo and Team Name in vibrant team colors, with a sewn on Jock Tag for personalization. Designed with a velcro neck closure and with an easy fit stretch front panel and band bottom to fit your pet with ease and maximum comfort. Contrast color sporty overlock stitching is detailed on the neck and bottom. Made out of soft and durable materials. Show off your loyalty to the Arizona State Sun Devils with this bold Steadfast snapback adjustable hat from Russell. It's made with lively graphics and distinctive colors that will effortlessly display your unyielding devotion. Anytime you wear this cap, everyone will see that you're ready for a big victory by your Arizona State Sun Devils. As a die-hard Arizona State Sun Devils fan, you love to show off that unwavering enthusiasm as often as possible. Now you can accomplish that goal with ease when you put on this Arizona State Sun Devils Endless adjustable hat from Russell. This cap features distinctive Arizona State Sun Devils graphics embroidered on the crown, so everyone will know your devotion to the team can't be beat. Look stylish while supporting your team with this "Olympus" long sleeve raglan shirt from Colosseum! This charcoal body long sleeve features screen printed team graphics, contrast team color arms and shoulder, and is a dual blend made of 52% Cotton/48% polyester. Officially licensed by the NCAA.